Yesterday I headed back to the San Rafael Swell in search of some more rock art. The upper ninety degree temperatures didn’t keep me away, but the high temperatures certainly made me keep my hikes short. Luckily the humid weather seems to have finally left the area and it was nice and dry out. Though, the gnats and mosquitoes seemed to be out in full force during this short hike in the morning. My first stop of the day brought me to the Broken-Hearted Man petroglyph. 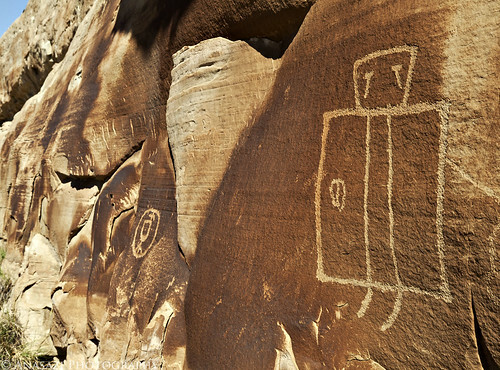 This square anthropomorph has the weeping eye motif normally associated with petroglyphs up around the Uinta Basin which is not very common in the Swell. The name of this particular petroglyph seems to stem from a story of a nearby burial that was found containing a woman and child (possibly both lost during childbirth). It is thought that this petroglyph may have been carved by the father of the child. It’s an interesting story, but I wonder if the Fremont held the same concept of a ‘broken heart’ that we do? Either way, it’s definitely a cool petroglyph.